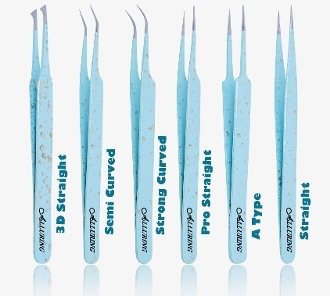 Curved tweezers are designed to provide good accessibility to the isolated eyelash extension. All of our eyelash extension tweezers have been engineered to have a light 'action', specifically designed to prevent repetitive strain injury from use in the eyelash extension technician's forefinger and thumb. These eyelash extension tweezers have been designed to have maximal surface area on the contact end, for ease of use when gripping eyelash extensions. Copyright © 2011-2019 Discount Eyelashes. All rights reserved.